Despite dominating throughout and creating chance after chance, Hibs left Starks Park empty handed after suffering their second successive defeat, leaving their hopes of a second place finish in the Championship hanging by a thread. Before the game, the Easter Road side’s fate was in their own hands however after Rangers beat Cowdenbeath 4-1 at Ibrox the pendulum has swung in favour of the Glasgow giants. Both clubs are now level on points but Rangers have a game in hand with time running out. 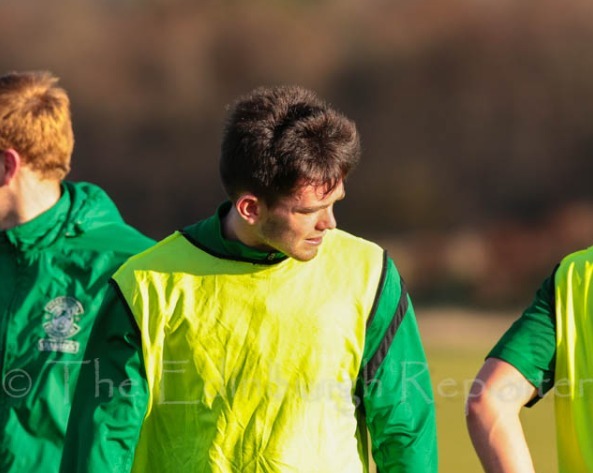 Head Coach Alan Stubbs made two changes to the starting XI that lost to Rangers last Sunday, with Keith Watson replacing the injured Paul Hanlon and Sam Stanton (pictured) taking over from Franck Dja Djedje. Farid El Alagui returned to the squad for the first time since he suffered a snapped achilles tendon against Alloa Athletic in August and took a seat on the bench alongside Jason Cummings who also made the list of substitutes after missing last weekend’s game with a knee knock. El Alagui was given a standing ovation from the large travelling support when he emerged for the warm up. Danny Handling who played for Scotland Under 21s against Hungry in midweek was rested after only returning to Edinburgh yesterday morning. Raith Rovers lined up without the injured Kevin Moon and the suspended former Hibs’ midfielder Martin Scott.Ex Hearts’ striker Christian Nade who has scored twice against Hibs this season started on the bench. Hibs lined up with Scott Robertson sitting in front of the back four and Sam Stanton playing behind Dominique Malonga up front leaving a three man midfield consisting of Scott Allan, Dylan McGeouch and Fraser Fyvie. The weather conditions forced Hibs to use a special bus to transport the players to Fife as the normal vehicle would not have been allowed to use the Forth Road Bridge due to the high winds. Gray then went close with another header from the right side of the six yard box but his effort flew just wide. Stanton went close with a shot and a Watson header went just over the bar as Hibs looked to grab the opener, then in the 30th minute, Malonga got on the end of a superb Gray cross but his header struck the junction of the post and bar. The ball was cleared for a corner which Allan sent over into the danger area, finding Stanton who was first to react but his header was cleared off the line. Just before the break, Stanton’s effort from the edge of the box was deflected wide and both teams returned to the dressing room with the scores level despite the Easter Road side having dominated throughout. Hibs started the second half in the same form as they finished the first and Robertson went close with a fine strike which flew inches over the bar. In the 53rd minute however Raith Rovers took the lead against the run of play when Jason Thomson sent a dangerous cross into the area which Mark Stewart headed into the net past Mark Oxley. Two minutes later, Watson flicked the ball into the path of Gray who managed to poke the ball goalwards but it struck the post and dribbled wide. In the 56th minute Hibs grabbed a deserved equaliser when Allan’s shot was deflected into the path of Fyvie who steered the ball into the net to the delight of the Hibs’ fans behind the goal. Hibs were then denied a blatant penalty when Craig Barr wrestled Malonga to the ground but unbelievably referee Alan Muir waved play on then moments later Gray then missed a great opportunity at the back post after a mistake from David McGurn as Hibs pressed. On the hour mark, Stubbs introduced Cummings in place of Stanton then Hibs almost took the lead when Allan found Gray inside the box but the full back’s strike was well saved by McGurn. With 15 minutes remaining El Alagui replaced Malonga in the Hibs’ attack whilst Nade replaced goal scorer Stewart. Moments later a Nade strike was saved by Oxley but the ball fell to Lewis Vaughan who slid the ball into the net. Martin Boyle immediately replaced Fyvie as Hibs looked for an equaliser but the Fifers held on to secure the three points. Hibs remain in second position level on points with Rangers who have a game in hand. Raith Rovers: McGurn, Thomson, Barr, Watson, McKeown, Anderson, Fox, Callachan, Conroy, Vaughan, Stewart. Subs: Cuthbert, Hill, Elliot, McKay, Nade, Robertson, Matthews.